When I decided to shed the security of a steady day job last summer, I knew my craft budget was going to take a serious hit. I thought I’d be bummed about not being able to spend at will, but it turns out that I’m having a blast crafting with my stash and filling in the blanks with thrift store finds. Lately I’ve been obsessed with repurposing wool. Last week I demonstrated how to make hats out of wool sweaters. 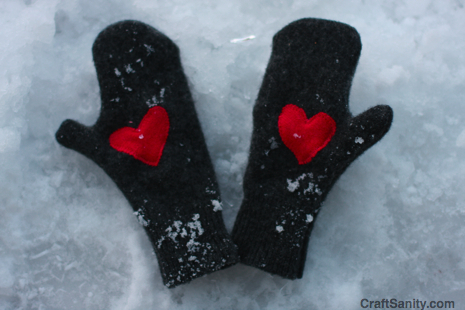 And this week I whipped up some custom fitting mittens. So fun! Here’s how to make some of your own. 1) The first step is to find a 100 percent wool sweater and completely disregard the washing instructions on the tag. (Goodwill is a great source for wool sweaters, or snag one from a friend who machine washed it by mistake.) If you can’t find a 100 percent wool sweater, no problem. If the sweater has at least 60 percent wool content, it will probably work. Once you find a suitable sweater, wash it on the hottest setting in your washing machine and then dry it in the dryer to full the fibers so they stick together and will not unravel when y0u cut your mitten shape. 2) Trace your hand onto a piece of paper with your thumb at about a 45 degree angle. Then go back and draw a mitten shape around the traced outline of your hand, adding about a half inch around to to allow for seam allowances. 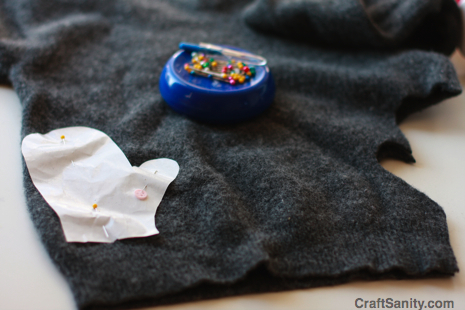 3) Turn your fulled sweater inside out and place your paper pattern just above the bottom ribbed edge of the sweater on the folded edge of the sweater. Cut out the shape, leaving the bottom ribbing attached. (The ribbing will form the cuff of the mitten.) Flip the pattern over and cut another mitten out of the opposite edge of the sweater. 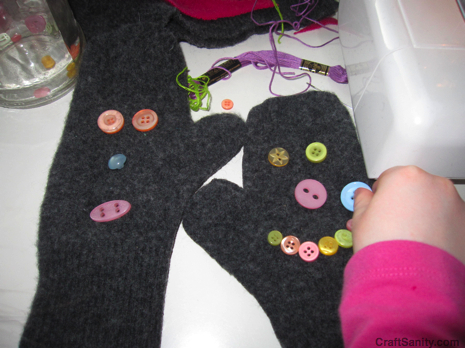 5) Once you’re done embellishing, fold right sides together and stitch around each mitten, leaving the bottom cuff open. Turn right side out and you’re ready to sport your new mittens. Enjoy!